King's Gambit Mason Gambit - Chess Gambits- Harking back to the 19th century! King's Gambit Mason Gambit- 1.e4 e5 2.f4 exf4 3.Nc3!? An extremely provocative line. White encourages Black to play 3...Qh4+ and force the white king out to e2, but aims to generate a strong centre and the ever-present threat of Nc3-d5, and gain time against the black queen, to compensate for being a pawn down with a misplaced king. Objectively, it doesn't provide full compensation, but I have to admit for having a soft spot for the line, as it can lead to very fascinating complications, and it has been used by Magnus Carlsen, albeit only in a blitz game. I have chosen not to cover 3.d4, which I believe is just bad for White after 3...Qh4+ 4.Ke2 d5. Black is not forced to check at h4, but 3...Ne7, which was tried against Carlsen, does not look particularly convincing to me, though if Black plays accurately it might equalise. This section of my King's Gambit coverage also gives me an excuse to smuggle in coverage of the Steinitz Gambit, which more commonly arises from the Vienna Gambit (1.e4 e5 2.Nc3 Nc6 3.f4 exf4 4.d4). The idea is the same, allowing Black to bring the white king out into e2, and it is has been promoted by the first "official" world champion, Wilhelm Steinitz. 3...Nc6 can, incidentally, be met by 4.Nc3 leading to lines that I cover here, or maybe to a line of the Quaade Gambit following 4.Nc3 g5 5.g3!?. After 3...Nc6 4.d4 Qh4+ 5.Ke2, I think White can be very satisfied with the outcome following 5...d6 6.Nf3 Bg4 7.Bxf4 0-0-0 8.Ke3!? 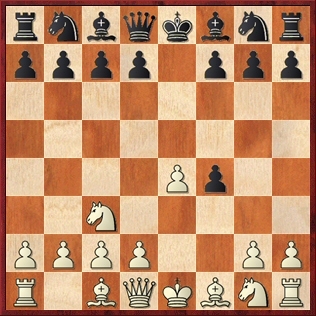 (also good are 8.Bg3 and 8.Qd2), as played by Steinitz himself. The king turns out to be a valuable defender of White's centre and it can eventually be tucked away at g1. More challenging for White is 5...b6, recommended by "brabo" at the Chesspublishing.com forum, which threatens a disruptive check at a6. White chooses between 6.Nb5 and 6.Qd2 (the latter is probably best, with 6...Ba6+ 7.Kd1 Bxf1 8.Nf3 Qh5 9.Rxf1 a typical continuation). White gets attacking chances but objectively probably falls a little short of full compensation for the pawn. This is the most critical test of 3.Nc3. Note that the old main line, which used to be recommended for Black in theory books, 4...d5 intending to quickly get at White's king with ...Bg4+, is not a serious test of White's idea. I suggest that following 5.Nxd5 Bg4+ 6.Nf3, White has at least an equal game. Black must either defend c7 with 6...Bd6, after which 7.d4 Nc6 8.c3 intending Kd2 and Kc1 is fine for White, or allow the knight into c7 and a8 with 6...Nc6 7.Nxc7+ Kd8 8.Nxa8 Ne5, but then 9.Qe1, exchanging off Black's powerful queen, gives White good chances. Instead, I think that Black is objectively a little better after 4...d6 (with the idea 5.Nf3 Qd8! ?, suggested by John Emms), 4...Ne7 (covering d5) and 4...Qe7, preparing to undermine White's e4-pawn. In each case White generally does best to get the king out of the way quickly with Ke2-f2 in the next two or three moves, and double-edged positions result in which White retains long-term attacking chances, but due to the misplaced white king on e2, probably not enough to fully compensate for the sacrificed pawn.